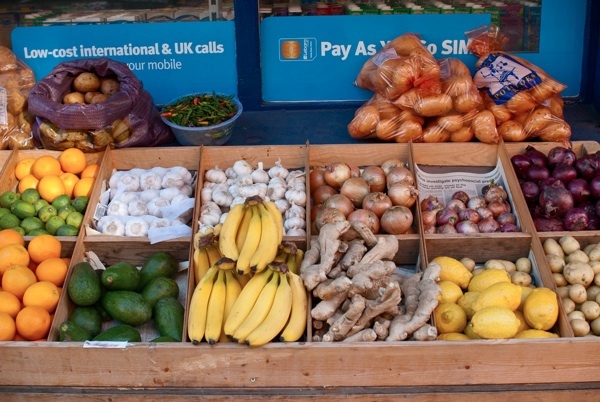 When Napoleon said that the English were a nation of shopkeepers, he meant it as an insult. 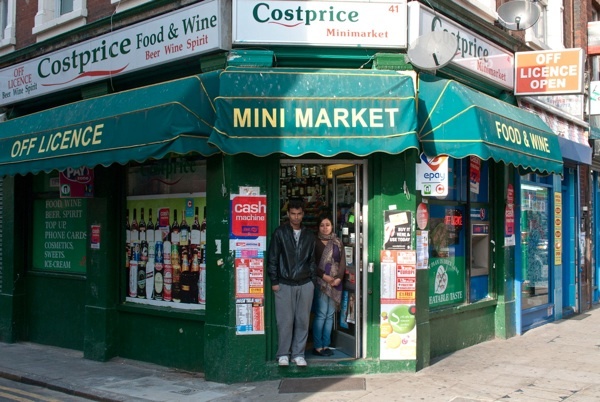 But he’d never been to the Costprice Minimarket at the apex of Fashion Street and Brick Lane. 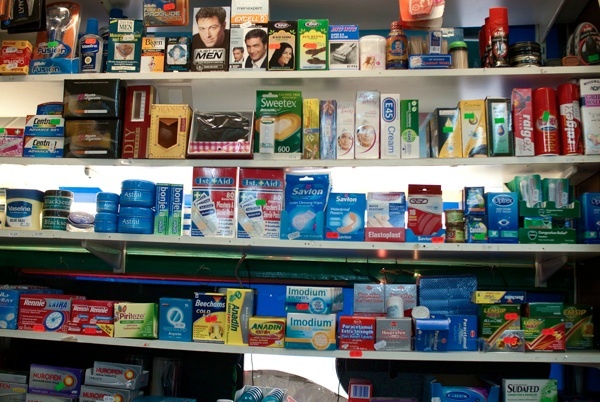 It is a typical corner shop: large windows blinded by adverts for Guinness and lager, walls plastered with ads for international phonecards, a volume and variety of products that would turn stocktaking into an act of desperate heroism: Sambuca, cockroach traps, memory sticks, Veuve Cliquot champagne, hair dye, air pistols, rum cream, doorbells, Swedish cider, elastic bands, corn oil, chess sets, porridge oats, rat poison, screws, coat hangers, and bottles of brandy bearing a picture of a certain French Emperor who came off rather badly at the Battle of Waterloo. 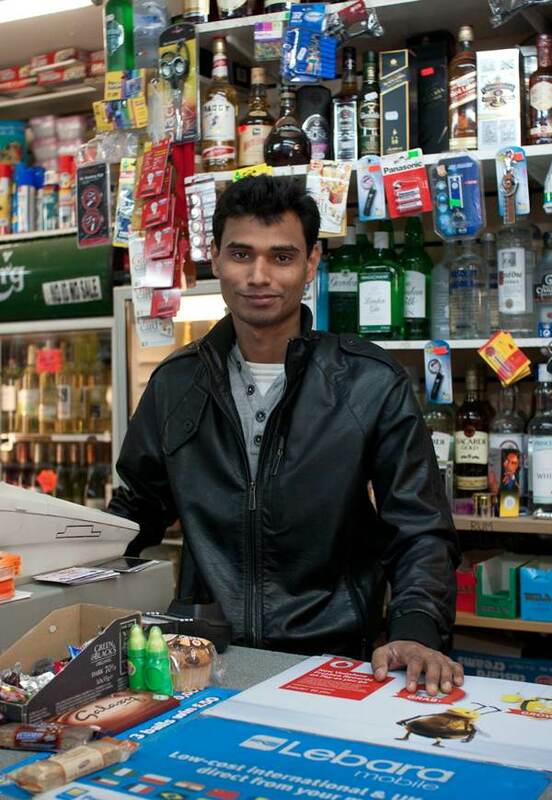 The man behind the counter today is Shafik Uddin, to whom the photographer Sarah Ainslie and I have been chatting for ten minutes before his colleague, Ruma, suddenly appears, emerging from the trap door to the cellar below. 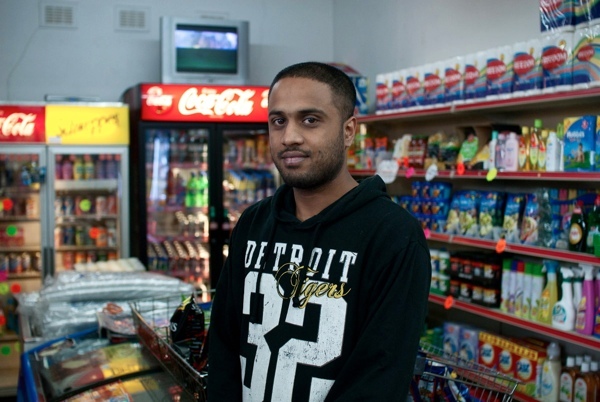 Shafik and Ruma are kept busy – the flow of customers is constant, particularly at the weekend, when Brick Lane fills up with tourists randy for a Balti. (The East European visitors, he says, are most keen on the lurid hubble-bubble pipes he stocks – which punters imagine are smoked by the Asian locals.) Despite all the traffic, Shafik says that business might be better – and might be excellent if some strange mischance removed the new Tesco Express from Shoreditch High Street. He and his boss case the supermarket’s special offers each week. 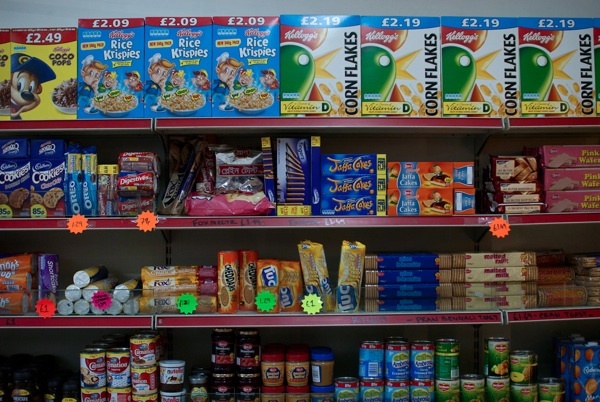 When he talks about the Tesco’s recent four-for-a-quid offer on a packet of biscuits that he has priced at a pound per packet, he is voicing the anxiety of every independent grocer in the country. 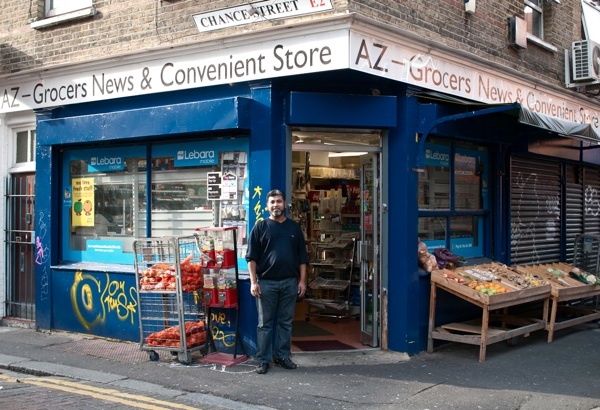 I heard nothing more optimistic from Mohammed Ashraf Mujahid, whose Grocers News and Convenient [sic] Store lies at the meeting point of Old Nichol Street and Chance Street. 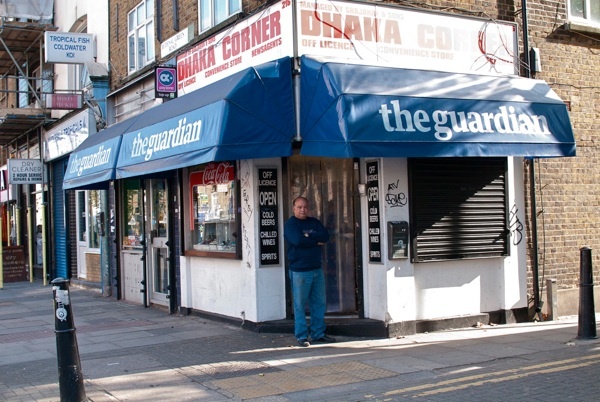 He has owned the place for four years, but he’s thinking of selling up and moving on. 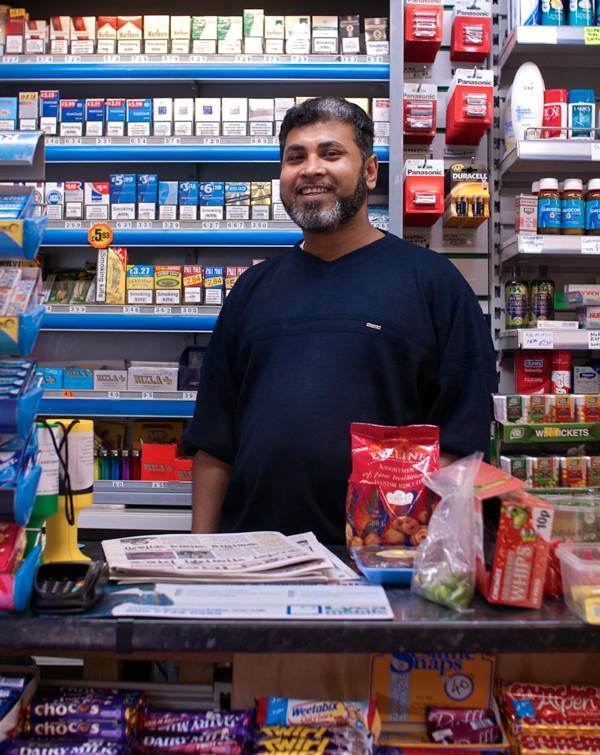 “The corner shop,” he says, “is going to die.” But he’s proud of his own store’s status as a hub of the local community, likes the fact that many of his customers are quite happy to come shopping in their pyjamas, and also understands the significance of his own role. “I see what’s going on round here. I’m security for people.” During the summer riots, his neighbours returned the favour, forming a protective cordon around the premises. The area, though, is changing subtly: the Asian families who colonised it thirty years ago are moving on. “They’re all moving east,” he says – and he means out to Dagenham rather than back to Bangladesh. When Sarah and I leave Zara’s Corner we strike north across Allen Gardens and the railway bridge, where a trio of street drinkers are occupying the concrete stairway. They’re in the thick of a beery argument, and the steps are wet with what I hope is Tennant’s Super. Ushaven and hare-eyed, these are fallen men who can fall no further. When Sarah and I appear, they apologise for blocking the way with touching primness. 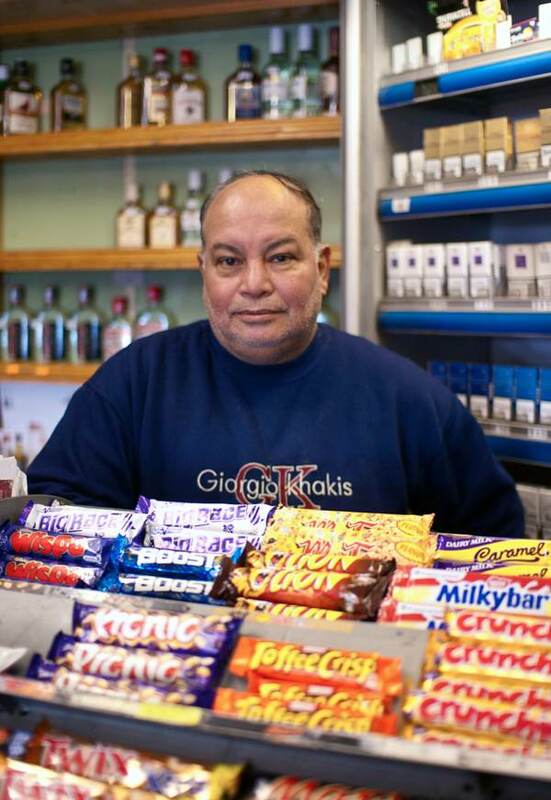 Beyond them, where St Matthew’s Row joins the Bethnal Green Road, is Dhaka Corner, where, for the last four years, Mr Shajahan has been standing behind the sweet counter. He took on the place when the premises from which he ran a clothing company was sold from under him by the landlord. Business, he says, is bad. “We are dying,” he shrugs, echoing the words of his opposite number on Old Nichol Street. “People don’t have money to spend. They don’t have jobs. Every month you have to pay the rent, and then the rates, then electricity bills.” His shop window is evidence of his attempts to specialise: it is filled with rows of children’s shoes, school blouses and ties. 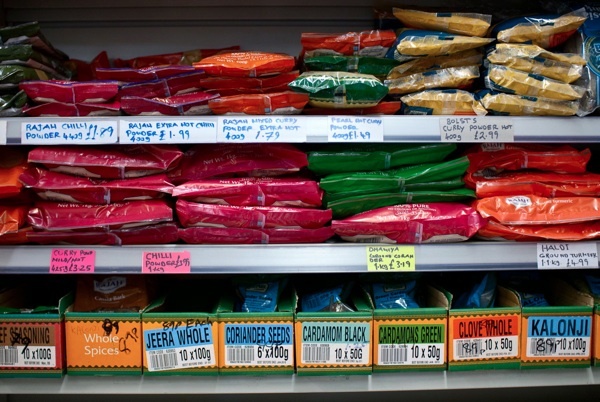 One of Mr Shajahan’s suppliers, waiting to see him about an order of stock, offers his diagnosis: “There was a time when you could only get Chinese ingredients, Indian ingredients, Caribbean ingredients in a small corner shop. 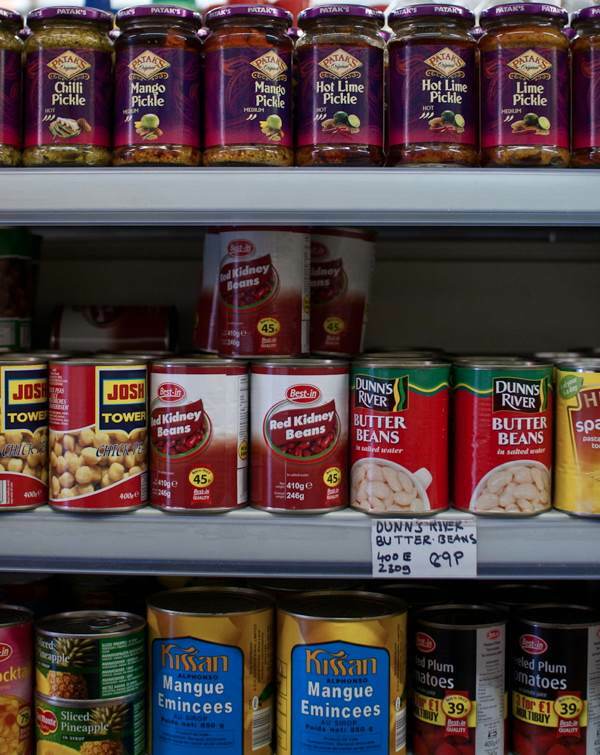 But now all of those have their own section in the supermarket.” I ask Mr Shajahan what he’s still selling. “Alcohol,” he replies, briskly. “To local people.” Local people, I suppose, like the men on the railway bridge. Napoleon Bonaparte refused to accept he was beaten until his own marshals refused to take his orders. 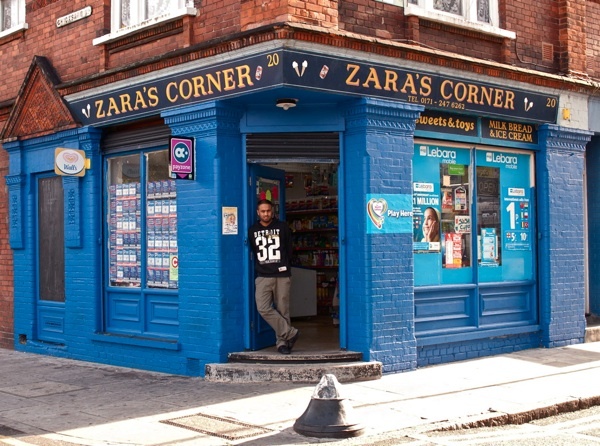 If the corner shops of England are as fated to oblivion as some of their proprietors suggest, then they are contemplating defeat with more good humour and dignity than the Emperor of France ever mustered. Here they are, among their fags and their sweets and their phonecards, finally facing their Waterloo. I buy my AA batteries on the corner of fashion street every Sunday morning, what nice chaps they are. 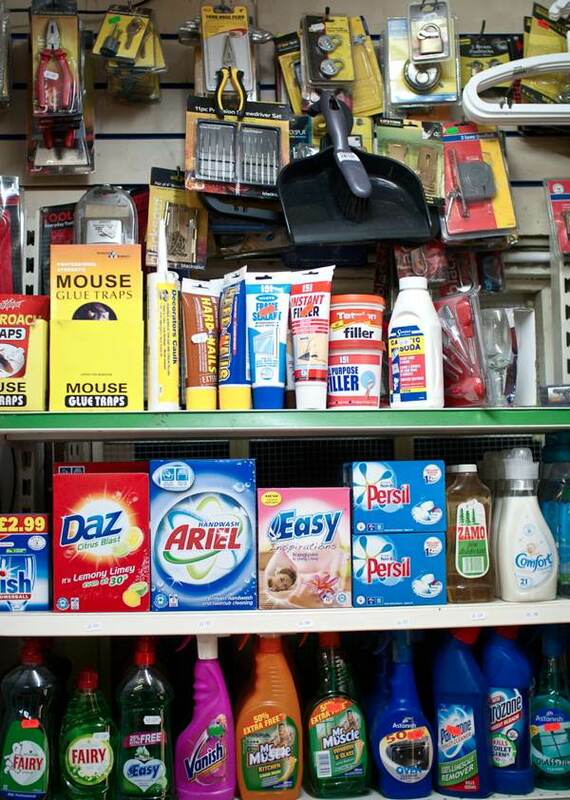 These are Aladdin’s Caves, what a fantastic array of goods. All those things you didn’t know you needed. While supermarkets are here to stay, and clearly meet a need in busy lives, we’d be foolish to let our independent shops fade away and die. Our local shops provide personal service and human contact, and will often source things especially for us. They don’t expect us to buy multi-packs we don’t especially want, and they’re usually in our own community – just a short walk away. We should use them: once they’ve closed their doors forever, they won’t be replaced. AND the money spent there circulates in our own community. Spend it in Tesco et al and it goes into their central coffers. Thanks for a great story. I’ve been a devotee of the Corner Shop all my life and I hope to corner shop ’till the day I die when I’ll go to corner shops in the sky. Check out Jonathan Richmans’ homage the the corner store on his aptly titled song, Corner Store. And I want them to put back my old corner store. Also, the same goes for coffee shops. It saddens me to see street after street populated by the big chains. An independent coffee shop that delivers both in quality and human customer service beats any chain hands down. Great work keep up your hard work. Dil shy. Brick lane minicab and courier. I was born in Chicksand House in 1964, just off Chicksand and Spelman Streets. My family used Zara’s daily and most of the other shops around there. I visit the area often and walk around. I went to Robert Montyfury School as a kid, its changed its name now but is still there..thanks..